I’ve joined up with the Festive Foodies this week for an event called #FarmersMarketWeek. 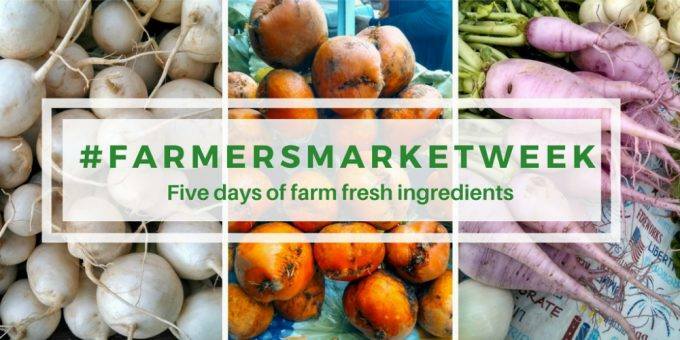 We’re getting together and sharing recipes with you using fresh produce or other ingredients you’d find at the Farmer’s Market. Our host is Ellen of Family Around the Table. 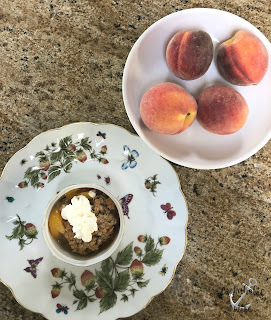 Is it just me or have the peaches been extra delicious so far this year? Usually it’s the middle of August before I find one sweet enough to eat, but this year I was getting them in the middle of July. Perhaps all of the rain we’ve had was actually good for something. 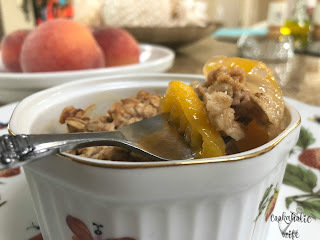 A while back Tom asked me why I don’t ever make a peach cobbler. So I used up some of the peaches we had and made him some. I just wasn’t…impressed. I think it’s the cobbler part I’m not a huge fan of. If the peaches are already baked and soft, I need some texture going on with the dish, not a sweet doughy topping. Two weeks ago I had spent a long weekend at my aunt’s house at the beach. As the weather report leading up to us leaving had continued to look increasingly dull, I asked my aunt if she’d mind if I brought a bunch of ingredients and just spent the weekend baking. She said that sounded like a perfect idea so I packed up some of my pantry to come along on the trip and we visited a grocery store there for the rest of it. 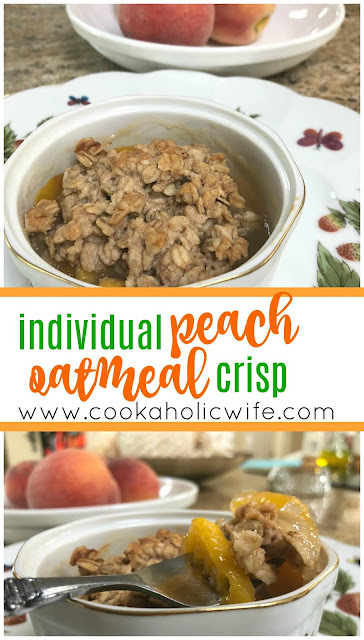 Individual Peach Crisps are an easy to make dessert or breakfast. Fresh peaches are topped with a sweetened oatmeal crisp and baked until golden perfection. 1. Preheat the oven to 350 degrees. Spray 4 ramekins with non-stick cooking spray. 2. In a large bowl, toss the peaches together with the sugar and the cornstarch. Divide evenly into the prepared ramekins. 3. In the same bowl, whisk together the butter, oats, flour, brown sugar, cinnamon and salt until mixed together and thick. Divide the mixture on top of each ramekin. 4. 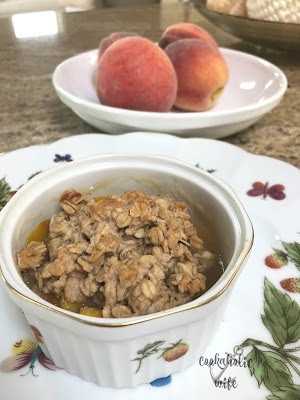 Bake for 30 minutes or until fruit is bubbly and oatmeal topping is lightly golden brown. 5. Let cool for 15 minutes before serving. Optionally: top with a scoop of vanilla ice cream or whipped cream. Oh wow is this delicious! The oatmeal mixed into the crisp gives it just enough texture to go against the soft, baked peaches. As I was making it, my aunt said “you know, since there’s oatmeal in here, you could even have it for breakfast.” I was thinking the exact same thing and since we had an extra one the next morning, I did just that! I “guess” you should skip the ice cream topping if you’re planning to serve this for breakfast, but then again, you only live once and how many times have you said you’ve had ice cream for breakfast?